Part-Time Means: Depending on the advertising project that comes in, it could be a single day ( such as for a parade or grand opening event) or a few consecutive weeks, up to a couple of months. Our main depot is in Linden NJ. For the local jobs ( you typically pick up a billboard truck in the morning and drive it locally for the day and drop it back at the depot at the end of the day. Other jobs may be over the road for a couple weeks up to a couple of months. We do not guarantee the length of any driving project. The better service you supply the more work we may have for you. 1. To see what we do just look around this web site. We drive advertising or public service messages around a targeted location with a dedicated sign truck. It’s basically not too demanding, no freight or tight delivery schedules. No heavy lifting or dangerous cash transactions. No need to be in a hurry. Safety is our main goal. This is a great opportunity for younger retired truck drivers and military veterans. CDL Preferred. Over 30 preferred. Military Veteran a plus. No points on License a big plus! Well groomed a big plus. Able to read and understand maps a plus. Having a smart phone that can take photos and text them a plus. Non-smoker a plus. 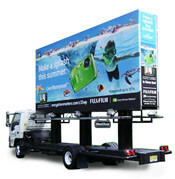 Mobile Billboard experience a plus, Even-tempered a plus, Flexible family / home situation a plus. 3. If the above (# 2.) is well understood and this is a position you believe are qualified for – to move forward with Billboards2Go, Please Fill Out the Application and if you have a One Page resume you may fax it along with the application. 4. IMPORTANT: PLEASE DO NOT SHOW UP AT OUR OFFICE OR DEPOT WITHOUT AN APPOINTMENT. SLACKERS NEED NOT APPLY. THIS IS NOT JOB TRAINING. YOU MUST KNOW HOW TO AND HAVE EXPERIENCE DRIVING A LARGE TRUCK. 5. AFTER WE REVIEW YOUR APPLICATION WE WILL GIVE YOU A CALL. IT MAY TAKE UP TO 24 HOURS TO A FULL WEEK BEFORE WE MAY BE ABLE TO CONTACT YOU ABOUT YOUR APPLICATION. ANY PERSONAL INFORMATION GIVEN TO US WILL BE DESTROYED AT YOUR REQUEST.